●Modular tooling using cartridge type live tools (option) for optimum allocation of machining capability. ●Beside the back spindle, additional tool post is attached. Deep hole drilling (up to 100 mm) can be realized. In addition, by adopting optional rotary tool beside the back spindle, the ability of front off-center machining is increased. ●Optional direct-drive rotary guide bushing provides high speed and accurate machining. ●Guide-bush type or guide-bushless type is selectable according to workpieces. 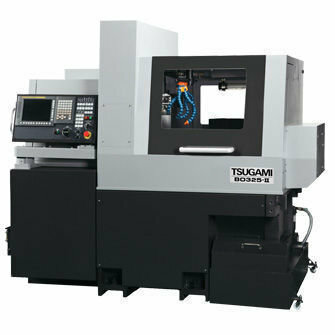 TSUGAMI is recognized worldwide for superior precision machine tools. The company is mainly engaged in the manufacture and sale of working machines. The Company's main products consist of automatic lathes, grinding machines, machining centers, rolling machines and other working equipment. Protecnic de México, S.A. de C.V.